Viviane Michel is from Maliotenam. 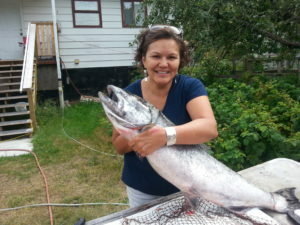 She is currently president of Quebec Native Women (QNW). She has been involved for over 10 years in QNW, first as director of the Innu Nation, then as Vice-President of the Association from 2010 to 2012. Bilingual, French and Innu Viviane Michel is a woman of tradition who makes it a point of honor to promote the traditional practices of her nation and to promote respect for the identity and culture of Indigenous nations and women. Her career as a frontline worker for the Missinak Aboriginal women shelter in Quebec led her to become familiar with the issues related to Aboriginal women. She also sat on the Aboriginal women shelters Network in Quebec coordinated by QNW which has developed many tools to adapt services to the cultural realities of Aboriginal women. In May of this year, Viviane travelled to her community as part of the community consultations organized by QNW and PASC on the gendered impacts of resource extraction. Alma Brooks is a Maliseet grandmother from the St. Mary’s First Nation in New Brunswick. She was an elected Band Councillor for one term before moving on to focus on the Maliseet Grand Council and the Wabanaki Confederacy, both traditional decision-making structures. 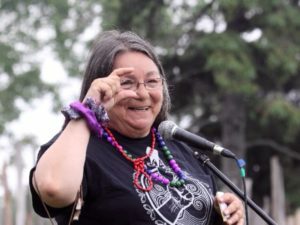 Alma has developed and facilitated many programs for her community over the years, and was acting President of the New Brunswick Native Council for 18 years. She is currently teaching a two year University Course in the Maliseet Language. Alma is a lifelong learner in the area of the environment – from her spiritual roots to the action on the front lines of many protests, demonstrations and campaigns. Presently, she is also working to raise funds for the Wabanaki Environmental Defense Fund. The Wabanaki Confederacy includes members of the Maliseet, Mi’kmaq, Passamaquoddy and Penobscot peoples in Atlantic Canada. The Confederacy has invited KAIROS to accompany them in their efforts to re-establish traditional forms of Indigenous governance in their territory, while actively working with local, national, and international partners to prevent ongoing and immediate threats to local lands and waters. 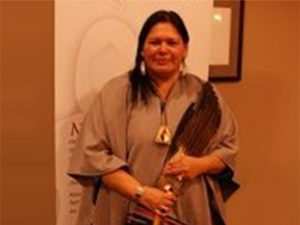 Alma participated in the Honouring Indigenous women’s wisdom delegation to the UN Permanent Forum on Indigenous Issues (UNPFII) in May 2014 and the KAIROS Gendered Impact: Indigenous women and resource extraction symposium and GEMM (Global Energy Minerals and Markets ) 2015 Dialogue in Vancouver in October 2015. 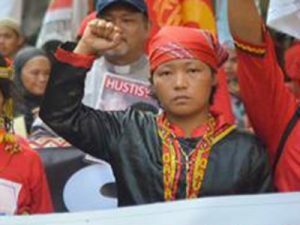 Beverly L. Longid is the coordinator of Indigenous Peoples Movement for Self-Determination and Liberation (IPMSDL) of the Philippines (IPMSDL). She is Igorot belonging to the Bontok-Kankanaeys of Sagada and Alba, Bontoc, Mountain Province, Phillipines. Beverly has a background in law has been a longstanding advocate for youth, and for Indigenous peoples in the Philippines and abroad through her active role in social movements and human rights organizations. 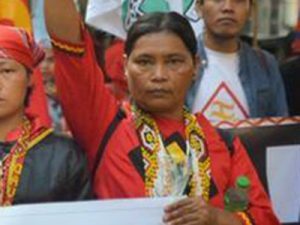 Beverly has also been a member and officer of the Cordillera Peoples’ Alliance (CPA) since 1992, serving as Education Commission staff, deputy secretary-general and chairperson. She is now a member of CPA’s Regional Advisory Council. Beverly was part of the planning team for the International Peoples Conference on Mining (IPCM) in 2015. Gloria Chicaiza Aguilar has a degree in clinical psychology from the Central University of Ecuador. She is a defender of the rights of nature. She is past President of Acción Ecológica, and is currently their Mining Justice Coordinator. She is on the Board of the Observatory of Mining Conflicts of Latin America (OCMAL). She is also a member of the Latin American network of women Defenders of the Social and Environmental Rights. Gloria was in Canada for the Ecumenical conference on mining in May 2011. In December 2015, she helped coordinate a delegation of 25 Indigenous women from Latin America to the UN COP 20 Dialogue on Climate Change. 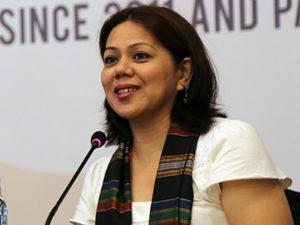 In July 2015, she travelled to the Philippines to participate and present at the International Peoples Conference on Mining. 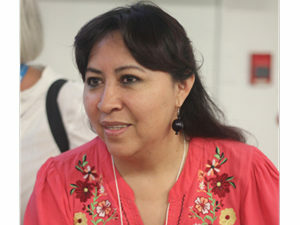 Gloria participated in the KAIROS Gendered Impact: Indigenous women and resource extraction symposium and GEMM (Global Energy Minerals and Markets ) 2015 Dialogue in Vancouver in October 2015 and the Convergence Assembly on Gendered Impacts of Resource Extraction organized by KAIROS and partner at the World Social Forum in Montreal, August 2016. Jacinda Mack is from the Secwepemc and Nuxalk indigenous peoples, of modern day British Columbia, Canada. 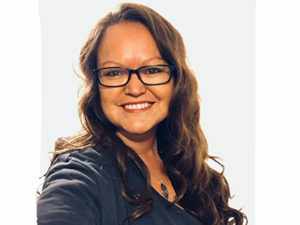 She has worked with First Nations communities on the central coast and northern interior of BC as a community organizer, researcher and Self Government Coordinator regarding First Nations territory-related issues. She makes her home in Williams Lake, one of the communities affected by the tailings spill at Mt. Polley which resulted in Canada’s worst mining disaster. Jacinda holds a Master of Arts degree from York University’s Communication & Culture Program, and a Bachelor of Arts from the University of Victoria. Jacinda has recently taken on a new role as coordinator of First Nations Women Advocating for Responsible Mining. Article outlining Jacinda’s role in alternative policies for mining. 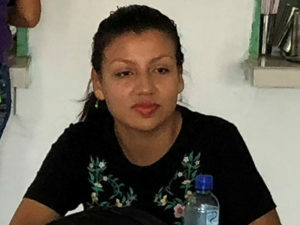 Kelly Johanna Campo Becerra was born in Barrancabermeja and has been a leader in the youth movement of the Popular Feminist Organization (OFP) for five years. She was part of the student movement of the University of Santander. Currently, she is working in project coordination within the OFP. 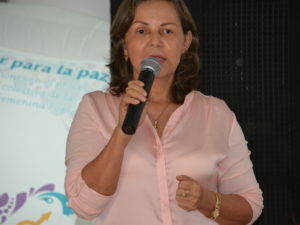 As a human rights defender, particularly a defender of women’s rights, Kelly has worked in community development and social and pyschological accompaniment in the Magdalena Medio and supported the process of collective reparations to the OFP within the current agreement with the Unit for Integral Attention and Reparations to Victim of the Colombian state. 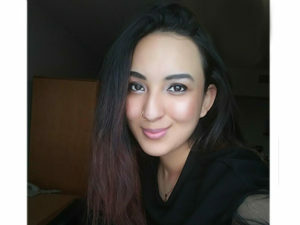 Lema Ijtemaye is the Manager of the Socio-Economic Development department at Pauktuutit Inuit Women of Canada, the national representative organization for Inuit women in Canada. She oversees the initiation, development, and completion of projects relating to a broad range of social and economic issues concerning Inuit women including political equality, women’s leadership, environmental issues, and resource extraction. Loretta Williams is one of the founding members of First Nations Women Advocating for Responsible Mining and is an elected leader of the Xeni Gwet’in, which is situated in a pristine area in the Interior of British Columbia. Xeni Gwet’in is one of 6 Tsilhqot’in communities. They are the River People and they take their responsibility to protect the water very seriously. Loretta’s community has been threatened by proposed mining. The Tsilhqot’in have been through two Canadian Environmental Assessments for a proposed open pit gold and copper mine project within the heart of their caretaker area. The projects were rejected twice by the Canadian Environmental Assessment Agency. Loretta is very proud of her community’s efforts in asserting jurisdiction of their territory over the years. It is because of this they find themselves where they are today: the first Aboriginal community in Canada to have Declared Title to a portion of their territory. Yvonne Sampear is a community activist from Ogies, in Mpumalanga Province, South Africa. The Founder of the Greater Phola Ogies Women’s Forum, Yvonne works to mobilize women around the effects of mining and extractive projects on their lives and livelihoods. In an area ravaged by coal mining and a large power station, women in the community have no access to energy themselves. Water has been diverted for use by mining concerns and as a result Yvonne and her group have staged a range of actions to highlight the plight of these women. 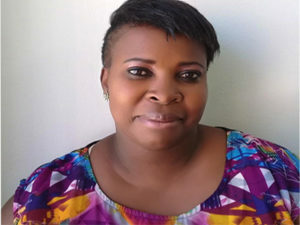 Yvonne also sits on the Steering Committee of the South African arm of a Regional Campaign on climate and energy justice called Women Building Power, and is a member of WoMin (African Women Unite Against Destructive Resource Extraction).